‘Kangana’ Demand Rs. 23 Crores For ‘Talaiva’ ! ‘Talaiva’ Movie will be directing by AL Vijay Direction based on Tamil Nadu’s late Chief Minister ‘PurtchiTalaivi’ ‘Jayalalitha’s life. 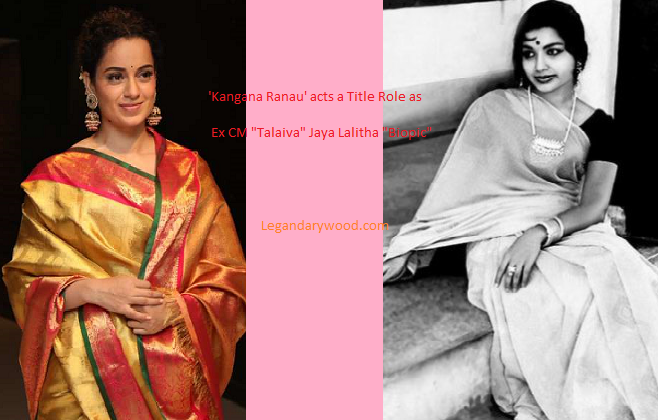 Vijayendra Prasad is giving the story for this movie and Bollywood Queen Kangana Ranaut will star in the title role. Already two Biopics ‘The Iron lady | PurtchiTalaivi’ Started based on her Life Story. Kangana Ranaut will be taking Rs. 23 crores for this movie & Producers were agreed the deal for giving, as of her crazy & Makers were planning to release in ‘Tamil, Hindi’ Languages. నోరుజారిన ‘లోకేష్’ కవర్ చేసుకోలేక ‘పాట్లు’ !